For the money, the Lumia 520 isn’t a badly spec’d phone. It is built around a 4″ display and features a 1GHz dual-core Krait processor with Adreno 305 graphics on Snapdragon S4 Plus platform (MSM8227). On paper, the cheap and cheerful 520 should blast through our battery tests with flying colors – the Krait cores are quite efficient and the smaller display means that the 1430mAh battery won’t have to break much sweat. Starting off with talk time, Nokia promises 9 hours and 40 minutes of 3G talk time, but actually our test unit lasted much longer than that – 13 hours and 33 minutes, in fact. That’s quite impressive and proves yet again just how efficient the dual-core CPU architecture is when in a phone call – its bigger sibling, the Lumia 720, did quite good too, managing north of 15 hours. The web browser performance continues with a very good time of 7 hours and 15 minutes. That’s just a bit over 20 minutes shy of the Lumia 720 score. Overall, it’s a very solid result as far as web browsing times go. 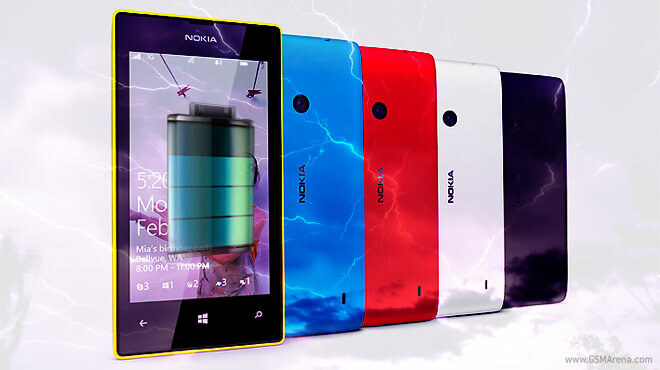 Just like the Lumia 720, video decoding isn’t one of the Nokia Lumia 520′s strongest abilities. Then again, this seems to be a trend for WP8 phones, with only one in our database scoring higher – the Lumia 610, which has a single-core CPU and a smaller screen. The Lumia 520 needed just 2 minutes to match the Lumia 820′s time. Finally, we get to the endurance rating. 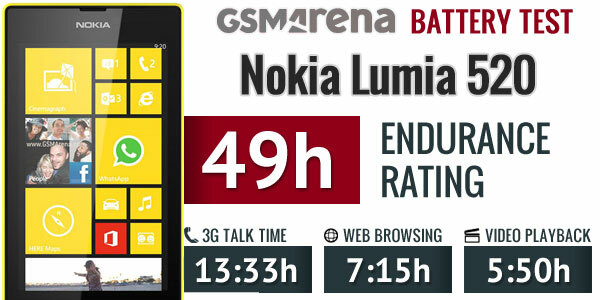 The standby time was quite okay and it helped the Lumia 520 score a rating of 49. That’s how long it can go between charges if you do an hour each of calling, browsing and watching videos per day. You can learn more about the test here. The only weak point of the Nokia Lumia 520 is video playback, but then its WP8 brethren don’t do much better. Other than that, the 520 offers talk time and web browsing endurance that beat almost all mid-range Androids. The low standby power draw means you never need to consider switching off the Wi-Fi overnight too.